This recipe sounds a bit complicated but it's the simplest way to make a sponge. Using two eggs should make approx 12 cakes depending on the size of your cake cases. Plus a little icing sugar for dusting. Place 12 cake cases in a muffin tray. It must be a muffin tray so the cakes grow upright. Add the eggs, butter, flour, caster sugar and baking powder into a bowl and mix with an electric whisk until smooth and creamy. Put into baking cases about half to 2 thirds full, we do not want the cakes to form a muffin top. While the cakes are cooling whip the cream until thick add a little sugar to taste but we don't want the cream to be too sweet. When the cakes are totally cool remove them from their cases and cut in half. spoon the jam into a bowl and mix until the jam goes a little runny. Spoon about a teaspoon of jam on the top of the bottom part of the cake then a dollop of cream, although I find it easier to pipe the cream onto the jam. Pop the top of the cake on and dust with a little icing sugar. I like to then put the cakes into a new cake case that's a little larger than the ones used to bake the cake. 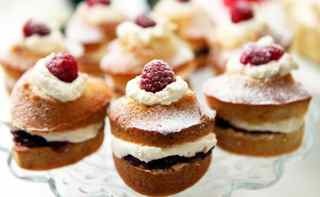 These Mini Victoria Sponges are great just like that and perfect for bake sales. If you wanted to be really flash however you could cut a little more off the top and add a bit more cream and a raspberry or strawberry like in the picture.